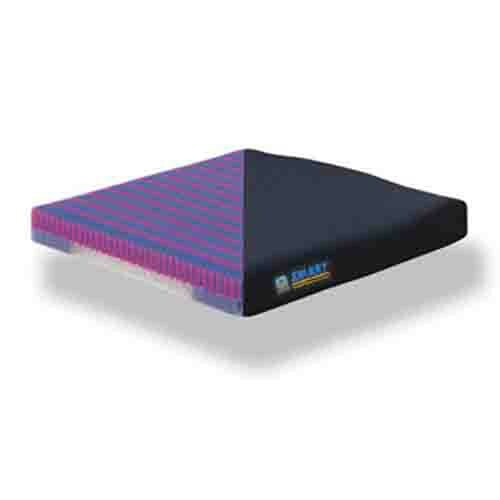 Stimulite Smart Seat Cushion, produced by Supracor, is a preeminent multi-faceted cushion. The Stimulite Smart Seat Cushion features a ventilated system, Stimulite honeycomb, that will regulate temperature and moisture. The Stimulite honeycomb technology allows the fusing of a soft top layer to a robust, firmer base with built-in bolsters so that the individual sitting on this cushion will receive optimal comfort, support and stability. In addition to exceptional comfort, support and stability, this cushion emphasizes a thick, plush cushion measuring at 2-inches. The Stimulite Smart Seat Cushion, additionally, weighs next to nothing at only 2 pounds, which means that this cushion is easy to transport. As with the entire line of Supracor seat cushions, the Stimulite Smart Seat Cushion is machine washable too. To efficiently alleviate discomfort and prevent decubitus ulcers, bed sores and pressure sores, order this long-lasting, yet comfortable and supportive all-purpose seat cushion for all of your sitting needs today! Product Numbers: SMRT1416, SMRT1616, SMRT1618, SMRT1816, SMRT1818, SMRT1820, SMRT2016, SMRT2018, SMRT2020.